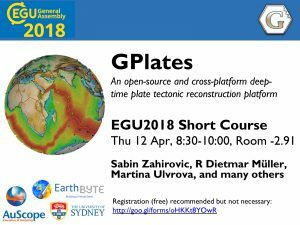 On 12 April, EarthByte members delivered a GPlates short course as part of the European Geosciences Union meeting in Vienna, Austria. The workshop was organised and delivered by Dr Sabin Zahirovic, Prof Dietmar Muller, and Dr Martina Ulvrova (ETH, Zurich), but also involved talented EarthByte students Amanda Thran and Wenchao Cao who helped users throughout the workshop. The workshop used GPlates 2.0 and outlined the new advances in GPlates Project Files, lithospheric deformation, and other new software features. GPlates is a community software package that allows users to visualise, create and modify digital plate tectonic reconstructions of geodata in deep geological time. GPlates is open-source and cross-platform (Windows, Linux and Mac), and has been used by a range of researchers in Earth sciences (e.g., plate tectonics, geodynamics, hydrocarbon and mineral prospectivity, paleobiology, paleo-climate, paleo-oceanography, deep carbon cycling, etc.). The workshop provides an introduction to the software to new users (e.g., how to combine your own data with plate reconstructions), while also covering new features in GPlates 2.0 for power users (e.g., project files, 3D volume visualisation, deforming plate reconstructions, etc.). You can follow the workshop if you bring your own laptop computer. You can download and install GPlates from www.gplates.org as well as the user manual, the tutorial documents and associated files.